a way of undermining the country? "Soon, after luxury products and extravagances began to appear on those working with U.S. and British forces, such women didn't hesitate in trying to lure others into working with occupation forces. It wasn't long before the courageous men of the resistance confronted each and every female that allowed herself to be employed by the criminal invaders." 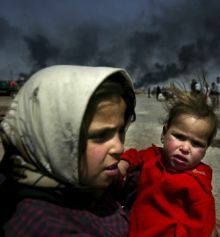 An Iraqi girl and her sister await a food shipment in Basra in 2003: Was it part of Washington's plan to attack the Iraqi family by hiring Iraqi women to work with U.S. and British forces - and undermine their ethics with Western luxuries? Asadi said he thought he might have gotten some of the official's words confused, and turned to his wife and children with his mouth wide open, hoping they could help clarify what he had just heard. With shame and with shock and awe similar to that brought by the Americans to Iraq nine years ago, they acquiesced. The exchange took place at the headquarters of Jordan's International Migration Department in Amman. When I asked other Iraqis who had refused to go to America, it turned out that these shameless Americans ask this question to all Iraqis who are granted asylum to the U.S. through the International Migration Department. All are met by a senior U.S. official to be asked this ugly question. At a 2007 seminar in Beirut, I delivered a lecture on U.S. occupation and the Iraqi resistance. Among the points I discussed was how U.S. forces were implementing a policy to damage the values of Iraqi society. The strategy was carried out on two fronts after the occupation began in 2003. The first was to provide incentives to Iraqi girls to work as employees in the Green Zone and on American bases, or as interpreters with U.S. units. Back then we didn't know why this segment of Iraqi society had been targeted by the resistance. There were many reports of death threats being dropped at the door steps of women and girls who continued to work with U.S. occupation forces. It was the same in Basra and Amara with women and girls working with British forces. The threats stated that after three warning letters, the "most dangerous decision" would be taken. Some abided by the warnings while others insisted on continuing to work. Soon, after luxury products and extravagances began to appear on those working with U.S. and British forces, such women didn't hesitate in trying to lure others into working with occupation forces. It wasn't long before the courageous men of the resistance confronted each and every female that allowed herself to be employed by the criminal invaders. At the symposium I said that early on, the resistance thwarted these plans to sabotage the Iraqi family. The resistance confronted this disease, which was planted and pursued by the United States, with everything it had. In fact the Americans wanted, as part of their occupation agenda, for girls working and collaborating with them to become prototypes for Iraqi society - beginning with material signs of decadence and luxury. If this plan had worked and without the deterrent force of the Iraqi resistance, one of the most dangerous threats to Iraqi society would have spread. The second front in this America scheme was for “politicians” that came with the U.S. occupation to set up "women's rights organizations." Iraqi politician Salah Omar Al Ali told me the names and details of these organizations, the programs of which were prepared long before the U.S. invasion. Such organizations tried to attract a slice of Iraqi women and girls. What shot these plans down was the awareness of Iraqis. As soon as they became conscious of these well hidden evil intentions, the women along with those managing and standing behind these organizations resigned. Now that American plans to damage Iraq's social fabric have proven futile, we see them behaving in this obscene fashion with Iraqis trying desperately to flee the country after the Americans and their horrific and dastardly machines transformed it into hell and they throw out these rude questions to men, women and children - questions that have never been uttered by any diplomat, senior or otherwise, at any international organization or embassy anywhere in the world.